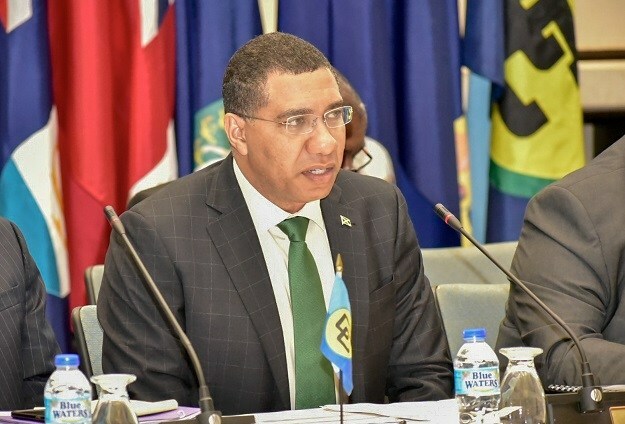 CARICOM Chairman, Prime Minister Andrew Holness of Jamaica has urged the ‘head on’ tackling of complex issues during the Special CARICOM Heads of Government Meeting on the CSME, taking place in Trinidad and Tobago. The two-day meeting, which wraps up on Tuesday, is addressing the rate of implementation of the CSME and making sure its benefits are available for Community nationals. “The issues slated for discussion at this Special Meeting of the Conference are of varying complexity,” Prime Minister Holness noted. (From left) – Prime Minister Dr Keith Rowley, Trinidad and Tobago (host); Prime Minister Andrew Holness, Jamaica – Chairman; Hon Chet Greene, Ministry of Foreign Affairs, Antigua and Barbuda; Prime Minister Mia Mottley, Barbados – Lead Head on CSME; Hon Wilfred Elrington, Minister of Foreign Affairs, Belize; Hon Francine Baron, Minister of Foreign and CARICOM Affairs, Dominica (Prime Minister Roosevelt Skerrit absent from photo); Prime Minister Dr Keith Mitchell, Grenada; Hon Carl Greenidge, Minister of Foreign Affairs, Guyana; President Jovenel Moise, Haiti; Ms Debra Lewis, Director, External Affairs, Montserrat; Prime Minister Allen Chastanet, Saint Lucia; Hon Vance Amory, Senior Minister, St Kitts and Nevis; Hon Camillo Gonsalves, Minister of Finance, St Vincent and the Grenadines; Hon Ashwin Adhin, Vice President, Suriname; Ambassador Irwin Larocque, Secretary-General, CARICOM. I bring greetings on behalf of the Government and people of Jamaica and I welcome this opportunity to say thank you to my colleague, Prime Minister Keith Rowley for the warm hospitality and excellent arrangements that have been put in place for this Special Meeting. You would all know of course that our colleague, President Granger will not be joining us this morning. I know it is the wish of all Heads of State and Government and of this entire gathering that our best wishes be conveyed to him, his family and the people of Guyana, for the strength to hasten his recovery and return to full service of the country he loves so well. Having just come from the G20 Summit in Buenos Aires, where I represented our countries in the capacity of Chairman-in-Office of CARICOM, I am pleased to report that it was a fruitful process of engagement. I had the opportunity to speak in the Plenary to two topics that are of critical importance to our Community – those being, the issue of the vulnerability of the small developing states of the Caribbean, especially the island states to the effects of Climate Change and the need for transition to clean and sustainable sources of energy, particularly renewables, mindful among other things of the correlation between extreme climate phenomena and emissions from the predominant use of fossil fuels. With specific reference to Climate Change, I was able to have my first meeting with President Macron of France, where we were joined by UN Secretary General Guterres, to discuss the modalities for leading our joint mandate to galvanize the US$100 billion committed almost 10 years ago by developed countries to deal with the issues of adaptation. In our case a parallel urgent need will be the building or resilience. As we are all painfully aware, the need for developed countries to meet this commitment is of paramount interest to our region and, in fact, to all vulnerable small island developing states. I will therefore keep you briefed as the process develops. Let me now turn to the business that has brought us here to Port of Spain. The issues slated for discussion at this Special Meeting of the Conference are of varying complexity. Some will no doubt evoke different, even conflicting views but we must confront them. We must also tackle ‘head on’ what the imperatives if we are to make this important regional integration process deliver on its promise. I am, however, encouraged by the fact that our Community has a long tradition of dialogue and compromise. For this reason, I remain convinced that our deliberations over these two days will culminate in unity of purpose and consensus on a strategy to not only expedite the CSME implementation process across Member States but to also to make the CSME more effective. I will soon conclude my Chairmanship of this Conference of Heads of our 45 year-old Community. I approach the end of my tenure with mixed feelings. I feel a sense of pride in the renewed energy placed behind efforts to make good on our commitments to our estimated sixteen million citizens. In some respects, we have sought to simply get things done by following through and implementing some critical decisions with a view to making the mechanisms within CARICOM rational and functional. However, it cannot have escaped your notice that even with this renewed energy and additional meetings, that implementation of our decisions remains uneven and less than optimal. We took the momentum generated at the 39th Regular Session held in Montego Bay to activate work that had lain dormant since 2013. We also took an important step to respond to the concerns of our Community Nationals that they want and indeed deserve to be treated better and with respect and dignity, when they are denied entry into a Member State. We adopted the Procedures on the Refusal of Entry, which provide the much needed guarantee that the rights of Community Nationals will be safeguarded when Member States assess that they are undesirable and will be a charge on the public purse. I trust we have all taken the necessary steps to implement the Procedures at our respective ports of entry. Some of us also demonstrated our firm commitment to ensure that the CSME Regimes not only work for the principal beneficiaries but also their families, through the signature of the Protocol on Contingent Rights. During the course of this special meeting, we will be expected to push the boundaries even further by addressing other important areas that need our full attention. 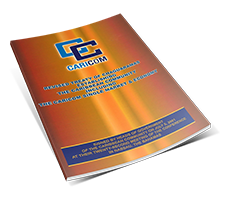 We will be called upon to examine in more detail lessons that can be gleaned from the Report of the Commission to Review Jamaica’s Relations within the CARICOM and CARIFORUM Frameworks – a Report, commissioned by me with the ultimate goal of not only determining which aspects of our regional engagements have not met their intended objectives to advance the regional integration process, in line with the Revised Treaty of Chaguaramas, but what changes we should make / what recommitments could ensure that the goals of the CSME be successfully achieved in the interest of all our peoples. I am gratified that the Conference, not only welcomed the Report as being an important analytical piece of work, in relation to the objectives of the CSME but we also agreed that the findings and recommendations in that Report ought to be examined in detail to determine what could be of most benefit to achieving the objectives of Member States and the Community. In this connection, we will, at this meeting, also be called upon to consider Some Salient Issues for Resolution in CARICOM – a Paper written by our colleague Ralph. As the longest serving Head of Government in our region and as the only Head of Government to have publicly commented on the contents of the CCRC Report shortly after its release, we are appreciative of the insightful comments of Prime Minister Gonsalves. We regret that he is not with us for this meeting, but we are sure that his Minister will represent him well presenting additional perspectives on how we can collectively and practically serve the interests of our countries and peoples. Within the context of the Prime Ministerial Sub-Committee on the CSME we have, with the determination and ingenuity of Prime Minister Mia Mottley, devised methods to improve stakeholder engagement and help create enabling support measures for a competitive Single Market. We have also begun a process of making radical adjustments to ensure the implementation of our collective trade and economic policies and to secure the consolidation of our single economic space. But in all of this, we have uneven implementation and a fundamental question of commitment. I could not close without recognizing the disappointing number of Heads of Government present today given the decision taken in Montego Bay and the expressed decision taken for us to have focused and pivotal discussions at this meeting. I know that Ministers are undoubtedly empowered to represent their governments, and I welcome you all, but the signal of commitment, is again, less than optimal. I anticipate that there will be frank and even spirited discussions on all agenda items, but emanating hopefully in constructive action, given what is at stake – a strong and prosperous CARICOM or a body lessening in credibility among the people who we serve. As we all focus on the attainment of the sustainable development goals at the regional level, we must act in concert to ensure that all the people of CARICOM can reap the benefits of regional integration process.